More than just a bar and restaurant, Montego Bay’s version of the Margaritaville chain is a Jamaica attraction in its own right. Situated on the Caribbean along the Hip Strip of Gloucester Avenue, the Jimmy Buffett–themed hot spot has a variety of water sports, a bustling nightlife scene, and island cuisine. Margaritaville visitors love the 120-foot (37-meter) waterslide that plunges into the ocean, as well as the collection of water trampolines and other fun floating structures, all watched over by lifeguards. Both bar decks feature nonstop entertainment, including music, dancing, and sports on big-screen TVs. The restaurant and bar serve the usual lineup of “cheeseburgers in paradise”—and no visit is complete without sampling the lineup of colorful tropical drinks. 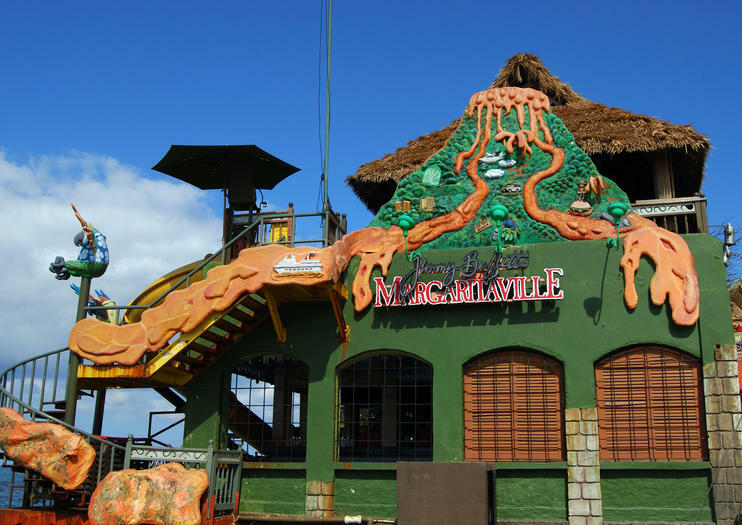 Day tours in and around Montego Bay often stop at Margaritaville for a drink or a meal, and can be combined with stops at the popular Doctor’s Cave Beach, or shopping on the Hip Strip. Shore excursions from Ocho Rios, Falmouth, and Negril often include Margaritaville with other area activities. Children are welcome at Margaritaville during the day; at night, the location transforms into a nightclub and is open only to those over 18 years old. No reservations are needed at Margaritaville, unless you are traveling with a large group. Margaritaville admission is free, though you are encouraged to purchase food and drinks. Margaritaville is accessible to wheelchair users. Margaritaville Montego Bay is located on the south end of Gloucester Avenue, about 10 minutes by taxi from the cruise ship pier. Margaritaville is one of the most popular spots on the Hip Strip, so expect a crowd, especially after 10pm, when the restaurant closes and converts to a nightclub. It's best to call or email ahead for reservations if arriving with a large group. Jimmy Buffett is an American musician turned businessman and philanthropist. His most famous songs—such as “Cheeseburger in Paradise,” “Grapefruit–Juicy Fruit,” and of course “Margaritaville,” after which his chain of restaurants is named—evoke a laid-back, island-style attitude. With Margaritaville locations all over the Caribbean, his spirit and whimsy can be felt at each one. Dance the night away at one of Montego Bay’s hottest clubs on this nightlife excursion to Margaritaville After Dark. Skip the long general admission lines and head straight inside for an all-you-can-drink open bar all night long. If you choose, upgrade for exclusive access to the VIP section, table service, and premium liquors. Plus, hotel pickup and drop-off in Montego Bay is included. Explore the landmarks and highlights of Montego Bay with a local guide on this private tour. Visit the Rose Hall Great House, shop for souvenirs and crafts on one of Montego Bay's local 'hip strips', then stop for lunch at Jimmy Buffet's world-famous Margaritaville (own expense). Journey to the top of Richmond Hill to see panoramic views of the city. Round-trip transportation by private vehicle is included. Explore the white sand Doctor's Cave Beach, the legendary Margaritaville and stroll along the 'hip-strip' for some shopping during this day trip from Montego Bay. With your local guide, enjoy the sun on your shoulders and the sand in your toes on the popular Doctor's Cave Beach. Head to Margaritaville to enjoy some entertainment, then walk down the bustling shopping streets for some souvenirs. Round-trip transportation from Montego Bay and Grand Palladium hotels is included. Explore Doctor's Cave Beach, visit the legendary Margaritaville and stroll along the 'hip-strip' for some shopping during this day trip from Falmouth. Enjoy the sun on your shoulders and the sand between your toes on the popular Doctor's Cave Beach, where you can relax or opt to participate in some water sports. Head to Jimmy Buffet's Margaritaville to enjoy some entertainment, food and drinks (own expense). Walk down the bustling shopping streets of downtown Montego Bay looking for locally made souvenirs and keepsakes. Round-trip transportation from Falmouth hotels is included.